As we're preparing for another craft show here in town, I wanted to have a little something different to hold our money. We've found that it's a little cumbersome to go back and forth to a cash box, and a fanny pack is pretty dated. 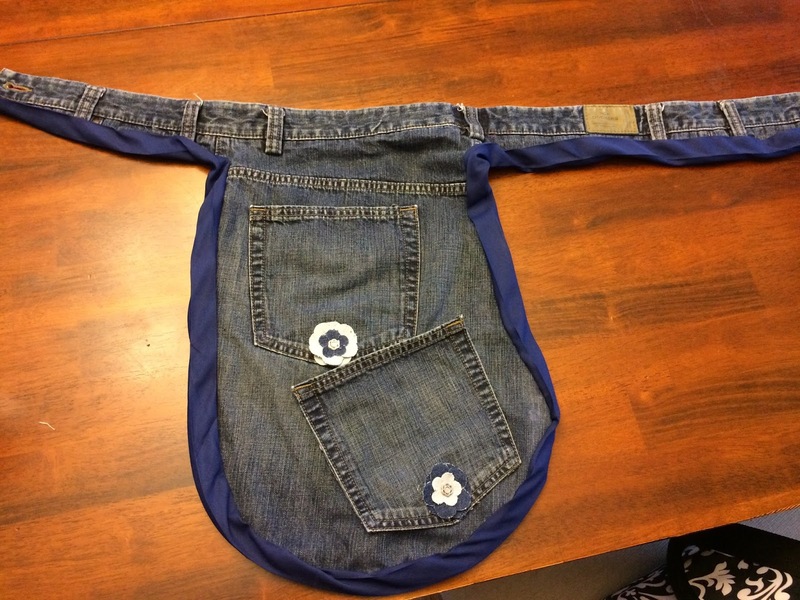 Instead, I found a picture of an adorable denim money apron and put my own spin on it. I'm not a seamstress by any means - I don't even really enjoy sewing - but I love this finished product. My special thanks to two of my Titus older women for their ideas and help. I found a pair of men's jeans at Goodwill just slightly larger than my size. This way they'll fit over whichever skirt I choose to wear, and the pockets will be deeper, since men's jeans have larger pockets than women's. Then I cut out the back right pocket. This one will become the bottom pocket of the finished apron. ... and chalk-marked the shape. Then I cut all the way around, staying inside the jeans' seams. I kept the whole waistband so it would serve as the clasp on my right hip. Then I cut out a matching backing from the other leg of the jeans. 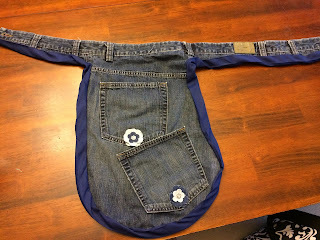 This way I'll have two small pockets (the actual back pockets from the jeans) and one large pocket that is the whole apron. Next I sewed the lower pocket on. And I attached the two big pieces together so the back lining would make one large pocket. I cut a slit just behind the top pocket so I could easily reach in to hide away large bills. I finished it off with some blue bias tape and two of the most adorable denim flowers I have ever seen. I'll let you knew in a couple of weeks if it serves all the purposes I want.